For any player, seeing a nice return on their investment after playing some Bitcoin slots is enough to make their day. But more often than not, these entertaining online casino games can produce something more than a few mBTC over your budget to give you a proper reward for choosing the right game. Such is the case with the next two slots, which have and are about to give you some good reasons to try them out. 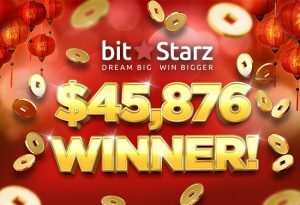 BitStarz Bitcoin Casino is a place where many slot players have had lucky wins, one of the more memorable being the $180K jackpot that was hit last November. The latest addition to the list of big jackpot winners at the casino was added a few days ago when a player from Australia scooped a $48,876 payout on iSoftBet’s Tree of Fortune. The lucky punter was not identified by the casino but details of his win were proudly shared on BitStarz’ blog. As the casino explains, the player hit the jackpot prize after a single spin on the Tree of Fortune, proving that BitStarz’ slogan – “Dream Big. Win Bigger” – isn’t just a marketing ploy. And although the win isn’t as monumental as some land-based slot jackpots are, it nevertheless is a win that is not to be overlooked. The Tree of Fortune is one of many Asian-themed slots and it features 5-reels and 243-ways-to-win. Armed with interesting extras like Wilds, Free Spins, and the option to re-spin each individual reel on your own, this slot offers players plenty of ways to turn their bets into some nice profits. And apart from this particular machine, the casino also has around 1,000 other games to offer, including a variety of iSoftBet slots which are popular with Aussie players. To see the full extent of the game collection, make sure that you check out BitStarz Casino. Another slot that will bring solid prizes to lucky slot players this month is BetSoft’s Sugar Pop 2, which was selected for a special tournament at Vegas Casino. A sequel to the original Sugar Pop, the second installment in the slot machine series likewise comes with the Level Up feature that lets you progress through the game to unlock new special symbols on your reels. The Sugar Pop 2 also comes pre-loaded with a host of extras like exploding bombs that give away cash prizes, 5 different wilds, 8 bonus symbols to unlock, as well as exploding cluster reels and double-or-nothing games. To honor this special Bitcoin slot, Vegas Casino is launching a new tournament that will hand out €2,000 in prizes and last between the 26th of April and May 2nd. The top 3 players get prizes of €1,000, €350, and €150, while 7 more players will get either €100 or €50 prizes, depending on the ranking. To enter this exciting tournament, you will need to be a member of the casino and wager €1 to get 1 point. The more points you gather, the closer you can come to winning the main prize. If you want to see the game in action before the tournament unrolls, head down to Vegas Casino and find the slots menu.